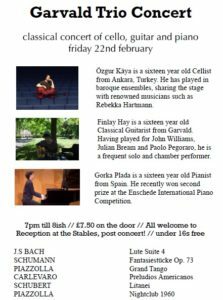 Garvald’s Finlay Hay and two of his friends from the Yehudi Menuhin School are going to perform at Garvald Church on Friday 22nd February at 7pm. Tickets are £7.50 on the door, U16s go free. This entry was posted in Events on February 4, 2019 by Admin.